It is our goal to deliver on-time service, provide customized orthodontic care, and improve the functioning of your teeth as well as their cosmetic appearance. Dr. Biljana Trpkova leads a team of attentive, qualified RDAs and an accommodating administrative team. We aim to provide you with efficient orthodontic treatment from your very first visit to our office until your treatment is complete. 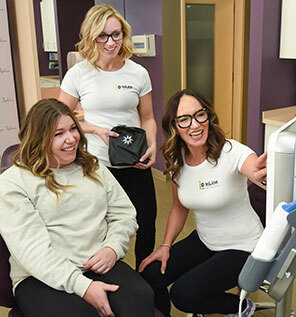 InLine Orthodontics uses digital technology to take X-rays and digital dental impressions. Damon® braces and Invisalign® are offered, as well as AcceleDent®. Dr. Biljana Trpkova has qualified as an Invisalign® Elite Provider based on her skill and expertise from treating over 300 patients with the aligner system. We have the ability to obtain a digital study model of your teeth and show your personalized treatment outcome in a matter of minutes! Our office is located in the south community of Shawnessy in Calgary, Alberta. We have ample ground-level parking right outside our door. We offer flexible appointment times as early and evening appointments to accommodate our patients who have busy schedules. For your convenience, we have an in-house laboratory.